I had no idea where this post belongs, since I use Evernote on Windows computers the most I figured I would post here even though my issue does not pertain to a specific platform. I have several IFTTT applets that run at 12AM MST on the 26th of every month. They did not run yesterday. 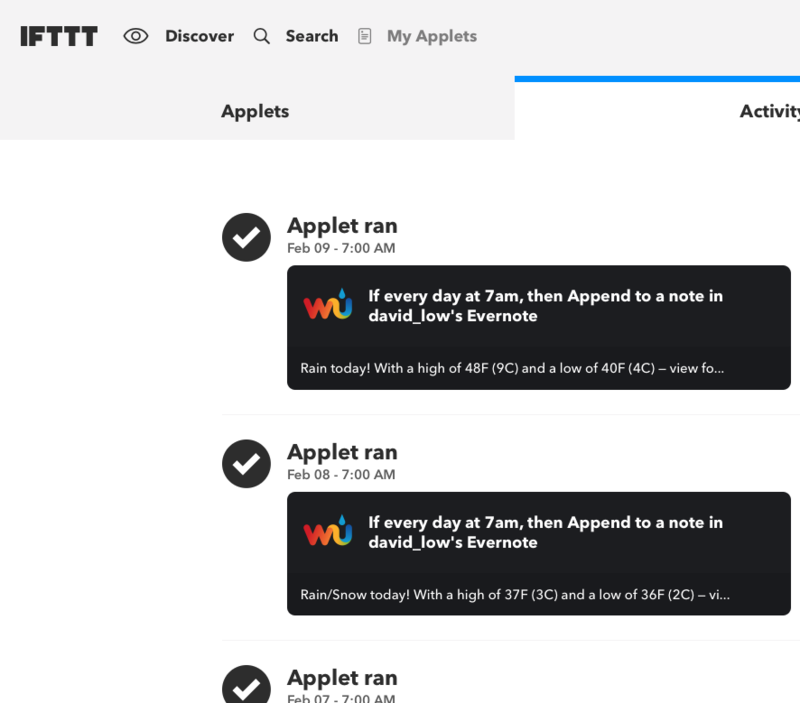 Any one have any issues with IFTTT applets not running lately? The applets in question all create a new note in my defaulte notebook with some tags. I think the Evernote service was down at 12 am MST on 1/26. See https://twitter.com/evernotestatus. Hello...I am praying that someone here can help me. I have been trying to get this resolved for weeks. I basically believe that I need help on how to enter pertinent information into IFTT and what specific link/url that I would use to put into IFTTT from Evernote,and where I would find that link/url, and how to add the link into the settings in IFTTT settings. I have yet to be able to use any of the applets because I can not get my apples to fully complete the tasks that they are supposed to do. I believe that the problem may lye in what information that I am/am not putting into the settings for each one. I have 2 very important ones. 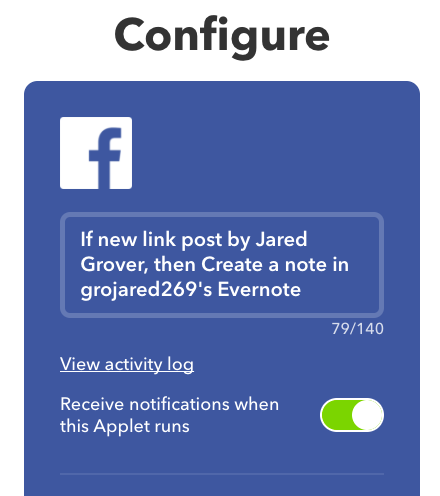 One of them is “If new link post by Jared Grover, then Create a note in grojared269’s Evernote”. This apple is currently recognizing when I post a new link in Facebook, but it is not posting it to my Evernote. This is likely due to something not added properly to the IFTTT settings. I have the settings screensaverr that will show what I see in my settings. I am completely unaware of which link I need to add to the settings to make this work, as well I do not know HOW or WHERE to add that link within the settings. Do I put the link IN PLACE OF the word “link” in the settings, OR do I place the link BEFORE or AFTER the word/button that says link? Which link do I use from evernote, where do I place it, and where do I find it in Evernote. Another important note..it shows that my username is grojared269, but my username I thought was my email address grojared@yahoo.com? Would this username be causing problems? Can you review the applet's log on IFTTT and confirm the trigger/action is executing?